Edward French, the son of a grocer, served in the Merchant Marine with the White Star Line before being commissioned into the Royal Navy Reserve. 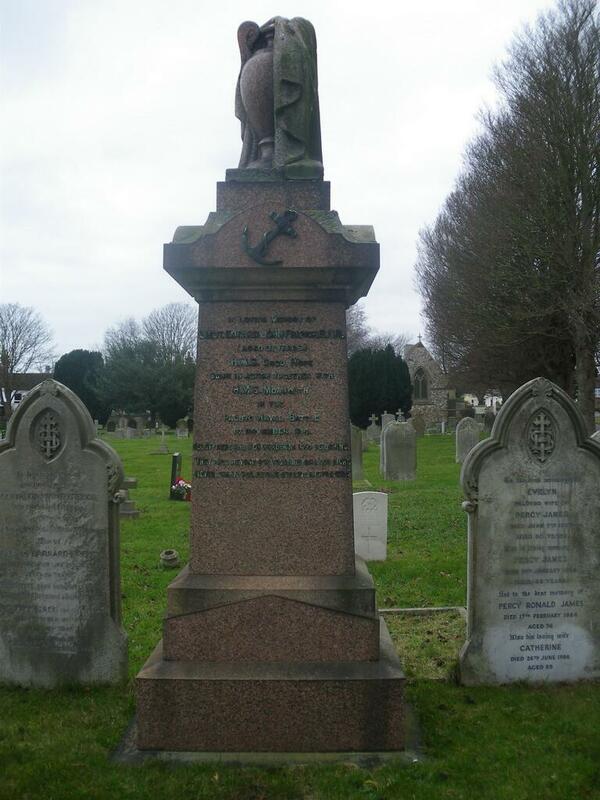 He was one of over 900 men lost when HMS Good Hope was sunk at the Battle of Coronel. Edward John French was born at 64 North Street, Portslade, on 8 November 1883, the younger son of Thomas Barnard Cheesman French (1847–1935) and his wife, Mary née Sargent (1850–1932). Thomas was born in Sheerness, Kent where his father was a ship’s chandler. 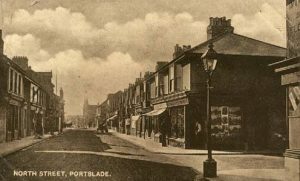 By 1871, he had settled in North Street, Portslade where he was in business as a grocer and married Mary Sargent, the daughter of a mariner from Shoreham, at St Nicholas’s Church in Portslade in August 1871. Their first child, also Thomas Barnard Cheesman, was born the following summer. There was then a gap of nearly five years before the couple had the first of three daughters, born between 1877 and 1880, with Edward being born after a further three-year gap. A fourth daughter was born seven years later, by when Mary was nearly 40. The family were regular churchgoers, attending St Andrew’s Church, in Church Street a few hundred yards from their home. Edward continued to live at the family home in North Street until his father retired in about 1905, and then moved with his parents to 67 Station Road, Portslade. Edward French, aged 24, was initiated into Duke of Richmond Lodge on 26 March 1908, passed to the second degree on 23 April and raised to the degree of master mason on 21 May 1908. At this time, the lodge was small with only the twelve surviving founders plus eight initiates. In January 1909, Edward’s elder brother, Thomas, was an initiate into Duke of Richmond Lodge. At the time of the 1901 census, Edward (aged 17) was still living with his parents at North Street and was employed as an apprentice seaman. 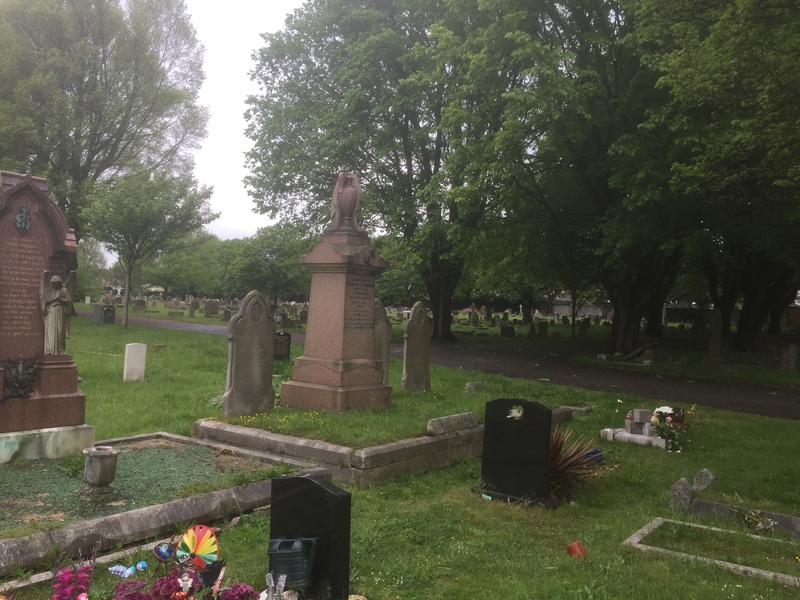 Ten years later, he was living at 24 Wellington Road, Peckham (with his 30 year old sister, Laura, who was a teacher for London County Council); Edward now described himself as a “ship’s officer”. Edward received his Certificate of Competency as the First Mate of a foreign-going ship from the Board of Trade on 4 August 1905. On 30 July 1909, he was issued with his Certificate of Competency as Master, followed by his Certificate of Competency as “Extra Master” on 20 May 1911..
His record of service with White Star Line says that he served a four-year apprenticeship with “W. Price & Co.” but gives no indication of the dates nor what Edward had been doing in the period from when his apprenticeship was complete until he joined White Star Line as a junior officer aged 27. William Price & Co. (later Chart Shipping Co. Limited) were based in Liverpool and the company’s vessels sailed throughout the world, including to Canada, California and New Zealand. Two of the company’s vessels were involved in enemy action during the war. The company’s steamer SS Dacre Hill was in port at Hamburg when war was declared. She was immediately confiscated and her crew were sent to a prisoner of war camp for the duration of the war. The vessel was taken into the service of the Imperial Navy and her name was changed to “Marie“. She was camouflaged and armed with four 10.5 cm guns and in 1916 was sent to East Africa to run the British blockade of the port of Lindi with supplies for the German forces. She was later seriously damaged by British gunfire but managed to escape across the Indian Ocean to the Dutch port of Batavia (now Jakarta), where she was impounded by the Dutch authorities. At the end of the war, she was returned to her original owners. 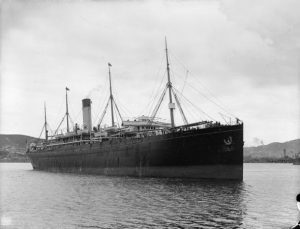 On 21 May 1915, the sailing ship Glenholm was returning from Chile to Cardiff with a cargo of nitrates when she was intercepted by a German U-boat U-27 off the coast of Ireland. The crew of the Glenholm were ordered to take to the ship’s lifeboats, following which the vessel was torpedoed and sunk. The crew all reached the Irish coast and were rescued in Bantry Bay. Edward French joined White Star Line on 17 August 1911 and served on SS Ionic initially as a junior officer, before being promoted to 3rd Officer in May 1912. The Ionic was a 12,352 ton liner built in 1902 to carry passengers and refrigerated meat between the United Kingdom and New Zealand. In September 1912, he transferred to the SS Zealandic for five months, followed by a month on the SS Baltic on the North Atlantic run. In April 1913, he was promoted to 2nd Officer on the SS Georgic, before finishing his career with the White Star Line on 1 April 1914 when he was 2nd Officer on the SS Bovic. On 1 October 1913, while still employed by White Star Line, Edward was commissioned into the Royal Navy Reserve as a sub-lieutenant. The Royal Naval Reserve (RNR) had been created in 1859 as a reserve of professional seamen from the British Merchant Navy and fishing fleets, who would undertake annual training in gunnery etc. with the Royal Navy and be called out for service in the fleet in time of war. His first officer training course was on HMS Venerable (moored off Spithead) between 29 October 1913 and 23 January 1914 which he completed “satisfactorily”. He joined the RNR full time in April 1914 and attended a gunnery course between 14 April and 6 June at HMS Excellent and HMS Vernon (both shore establishments in Portsmouth Harbour), showing “excellent ability”. In July, he spent 10 days training on board HMS Bacchante which he completed “very satisfactorily”. On the outbreak of war, he was initially posted to HMS Sappho (an Apollo-class cruiser launched in 1891) but on 24 August 1914, he transferred to HMS Good Hope. 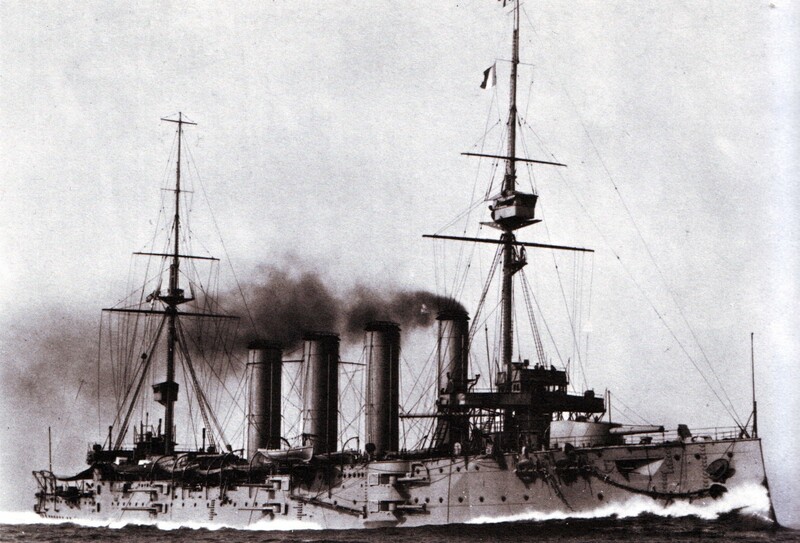 HMS Good Hope was a Drake-class armoured cruiser launched in 1901. She was considered “one of the worst and most expensive types of ship ever built for the Navy in modern times”, and by 1913, she was already outdated and was placed in reserve, but was re-commissioned in the summer of 1914. She was assigned to the 4th Cruiser Squadron based in the western Atlantic, becoming the flagship for Rear-Admiral Sir Christopher Cradock. By September, the squadron was off the coast of South America on the look-out for German ships preying upon British merchant ships. Having failed to locate the enemy, Cradock moved the squadron further south in a fruitless search for Vice-Admiral Maximilian von Spee’s East Asia Squadron around Cape Horn and the Tierra del Fuego area. On the afternoon of 1 November 1914, Cradock’s squadron, comprising two armoured cruisers HMS Good Hope and HMS Monmouth, the light cruiser HMS Glasgow, and HMS Otranto (a converted liner) engaged von Spee’s squadron, comprising the armoured cruisers SMS Scharnhorst and Gneisenau and the light cruisers SMS Dresden, Leipzig and Nürnberg, off Coronel on the coast of Chile. The German squadron were modern vessels which were much faster and more heavily armed than the elderly British squadron. Von Spee managed to manoeuvre his vessels so that the British ships were silhouetted against the setting sun while the German ships became indistinguishable from the shoreline behind them. At about 19:30, Good Hope and Monmouth caught fire from the heavy bombardment; despite this Good Hope carried on firing, continuing to close on the German ships and receiving more and more fire. By 19:50, she had ceased firing; subsequently her forward section exploded, then she broke apart and sank, with all hands, a total of 919 officers and men. Monmouth was sunk at about 22:00, with the loss of a further 735 men. 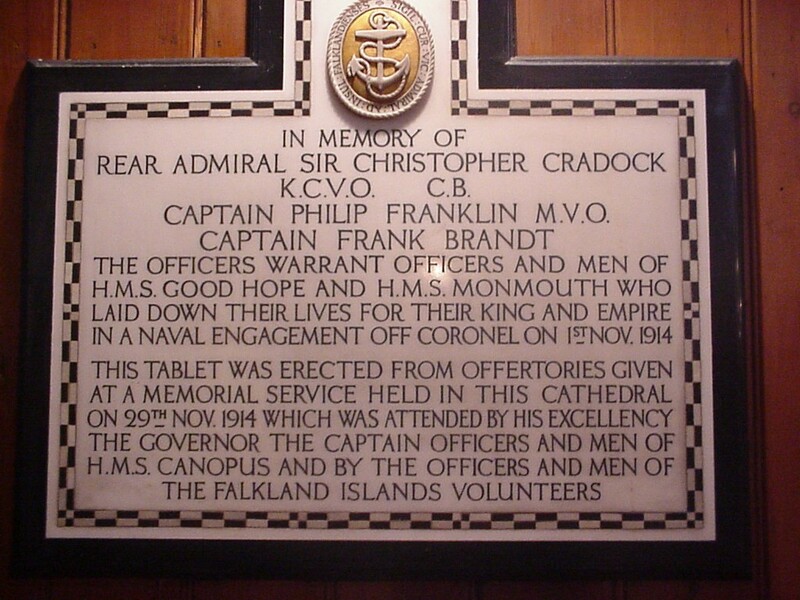 The defeat at Coronel was Britain’s first naval defeat since 1812 and the British were swift to gain revenge, defeating von Spee at the Battle of the Falkland Islands on 8 December, with the loss of four German cruisers and nearly 1,900 men. 33 Freemasons lost their lives at the Battle of Coronel, including Lieutenant Edward John French. The casualties of the battle are commemorated on the Portsmouth Naval Memorial on Southsea Common. 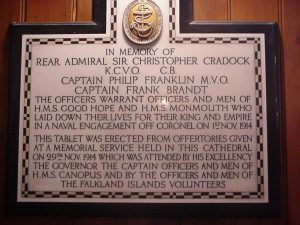 There is also a memorial to Rear-Admiral Cradock and the men of Good Hope and Monmouth, which was installed in Stanley Cathedral on 1 November 2014, the 100th anniversary of the battle. Never, thank God, beyond our love and prayers. In St Andrew’s Church, there was a stained glass window in his memory, depicting Jesus walking across the waves to St Peter; sadly, this was removed in 2003, when part of the church was converted into a community centre, although the window has been conserved by the London Stained Glass Repository, a charity run by the Worshipful Company of Glaziers. ADM 240/82/184 Name: Edward J French Rank: Acting Lieutenant. Date of Seniority: August 1914. Window at St Andrew’s Church: The London Stained Glass Repository: St Peter coming to the Lord.